I don't pretend to be a professional photographer. I know that I still have a lot to learn, just like everything else in life. But so many of you ask me for photography tips every day that I suppose it's only fair to humor you. Now, some of you may be satisfied with the simple summary I usually give people: I use a Nikon D5100 with a Nikon 35mm f/1.8 lens and all natural lighting. If that's all you wanted to know, feel free to leave now and go on with your life. If you came here to learn all the knowledge I have collected in my browsing of articles and other tidbits on the internet (and my own experience), kick back and grab a bag of peanut m&ms, cause here we go. If you want to take good pictures, you're going to need a good camera. Now I don't want you to think that you can just buy the most expensive camera you can find and your pictures will automatically look professional. You can take horrible pictures with a great camera if you don't know how to use it, and you can take awesome pictures with a cheap camera when you do know how to use it. The main thing is getting a camera that you feel comfortable with. Now if you're not aiming to be a professional and just want a small camera for personal photos, just stick with a small point-and-shoot. I prefer Canon Powershot over Nikon Coolpix for small cameras, mostly just because the menu is easier to navigate. But maybe that's just me. You could also try Sony or Fujifilm. You'll have to decide that for yourselves. But as far as a compact digital camera, I'm a Canon girl. I took this with a Canon Powershot SX200 IS a few years ago. If you're ready for a step up from the compact digital cameras, it's time for you first DSLR. The coolest thing about moving on to a DSLR is that now you get to choose your own lenses (we'll get to that later). Now as far as DSLRs, I actually prefer Nikon DSLRs over Canon EOSs . That's just my personal preference, so feel free to disagree. And don't get me wrong, I loved my old Canon EOS Rebel T3 . It was great for a beginner. I've just found that I'm more comfortable with Nikon DSLRs. People are pretty much split about it though, so you'll have to decide for yourself. The fact is, the actual features of the camera are much more important than the brand. Just keep in mind, Canon lenses are not compatible with Nikon cameras and vice versa, so once you choose your camera, you should stick with whatever brand you chose (unless your old Canon compatible lens broke like mine did and you decide you want to try something new). 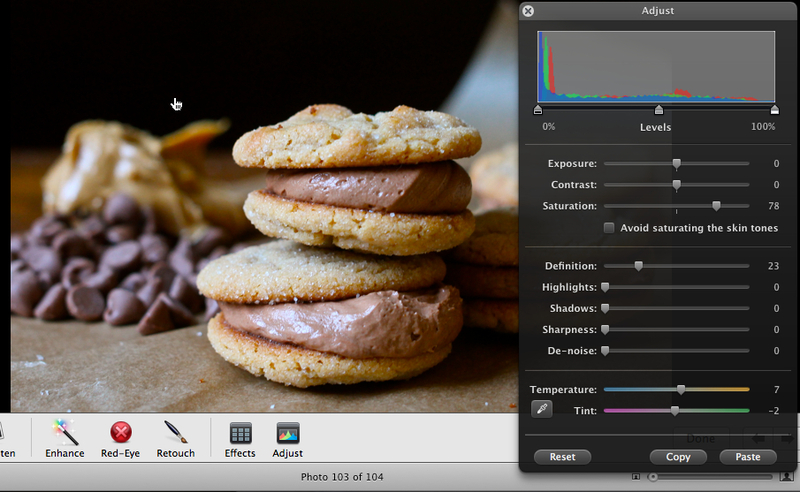 When you're choosing your DSLR, Snapsort is one of the best tools for comparing cameras. You can actually use it to compare compact digital cameras too. 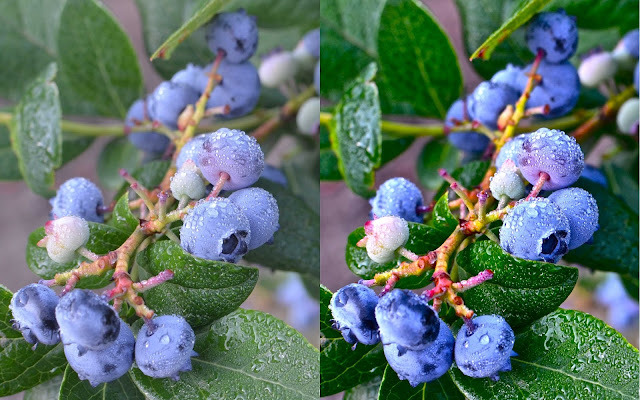 Here's a screenshot from Snapsort, comparing both of my cameras. My dream camera is the Nikon D800 . The Nikon D800 is $2,799.95. I have the Nikon D5100 which is $500. I am happy. Like I said before, the main thing is knowing how to use whatever you've got. Sure my pictures could be better with a $3000 camera, but for now, the D5100 works just fine. That just kind of goes without saying. I'll get more into ISO later on, but for now, just know that low noise at high ISO means a crisper image with low lighting. Very important. Does it even have video? Does it have auto-focus capabilities during video? Does it have HD? That's really up to you. You know on low resolution picture how you can see all the individual boxes of solid color and it looks "pixellated"? To avoid that, you want a lot of megapixels so that you can have a large photo (or crop and enlarge a small portion of the photo if you need too) without seeing any hint of those individual squares. Believe me though, unless you're interested in making wallpaper out of your photos, pretty much any number of megapixels that the DSLRs have to offer would be sufficient. As you can see, there's no use cropping and zooming with a low megapixel camera. As I understand it, a large dynamic range will capture a large range of lights and darks, shadows and highlights. Again, this kind of goes without saying. The sensor is the heart of your camera. 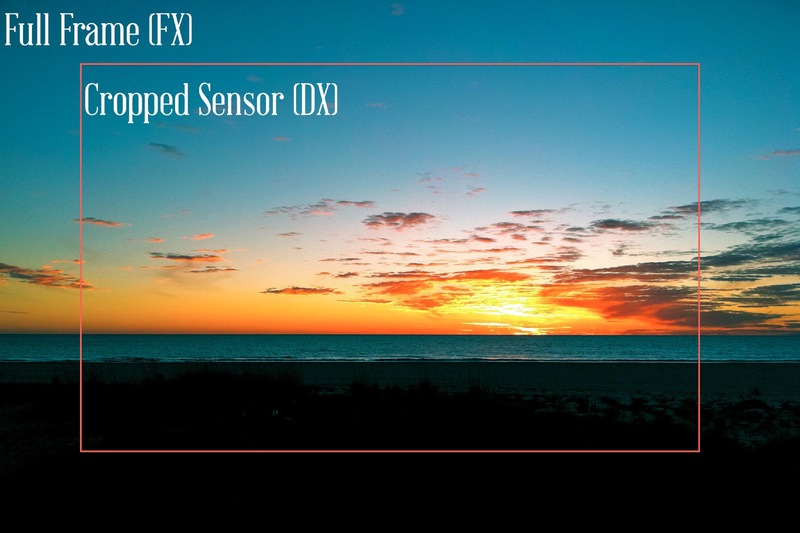 The main difference between the two types of sensors is that a cropped sensor (DX) will give you cropped or "zoomed in" photos compared to a full frame (FX) camera using the same lens. FX cameras are much clearer, crisper, and much more expensive than DX cameras. Also, DX lenses don't necessarily work on an FX camera, but FX lenses usually work on a DX camera. Below is an example of FX vs. DX. Of course this is only an approximation since I don't actually have a full frame camera, but it should help you get the idea. The entire photo might be how it would look if I had taken this photo with with a FX camera and a 55mm lens. The cropped area is how it would look if I used that same 55mm lens on a DX camera. Actually the hilarious thing is.... I just realized this is an iPhone picture. Like I say, the camera doesn't make the photographer. At first I thought that the shutter lag was just way too slow on my Nikon D5100 , but if you switch from Single Shooting to Continuous Shooting there is absolutely no problem. In other words, the D5100 works best as a machine gun camera, so don't try to use it as a semi-automatic (can you tell I have brothers?). An important thing to remember is that no camera will ever capture reality as well as our own amazing, God-made eyes. There really is no comparison. The thing to look for in a camera is whatever comes closest to the way your own eyes perceive the world. The aperture is the pupil of your lens. It decides how much light to let into the camera when you're taking a photo. A wide aperture, or a "dilated pupil", will give your photo more light and it will also give you more bokeh (a.k.a. 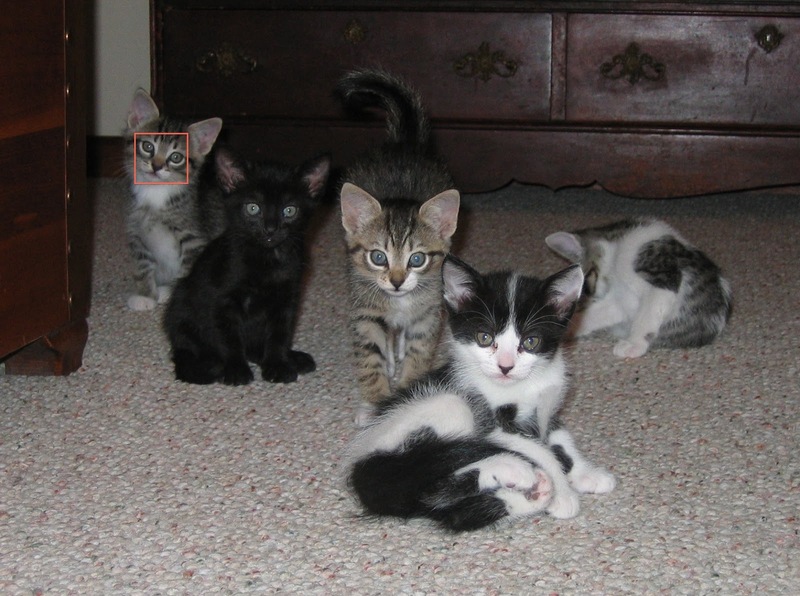 "blurry background"). Bokeh is my best friend. It makes the subject look so much more sharp when the background is blurred and gives your photos that professional look. Note: a smaller number means a wider aperture (more background blur, more light enters) and a larger number means a smaller aperture (less background blur, less light enters). I almost always shoot between f/1.4 and f/2. When buying a lens, take into account that the aperture listed for the lens is the widest the aperture can open. My current lens is a f/1.8 lens. That means it can open up to f/1.8 and it can close down to f/22. As you can see in the image on the right, the aperture opens just like your pupil when it needs to let in more light. I'm not a huge fan of zoom lenses, mostly because they don't have a very wide aperture. Zoom lenses can rarely go wider than f/2.8 at their shortest focal length. For me, that's simply not wide enough. Depending on what you're photographing though, you might find that a zoom lens is the lens for you. The downside of a prime lens is obviously that they don't zoom, but have a fixed focal length. Imagine that the zoom on your point and shoot was broken, and you had to actually walk towards your subject to zoom up. That's how it is with a prime lens. Now, if you're a tourist and you want to take a picture of a seagull flying far out in the water and an instant later you want to take a picture of your baby sister standing at your feet looking up at you, you may want to think about getting a zoom lens. But if you're here for food photography or portrait photography, you will definitely want a prime lens. A smaller number means closer, a bigger number means farther. This means 80mm on a cropped sensor will look "zoomed out" and 28mm will look "zoomed in". If you have a DX camera (like me), you'll probably need a lens about 35mm in focal length. This would probably be about the same perspective as a 55mm lens on an FX camera. 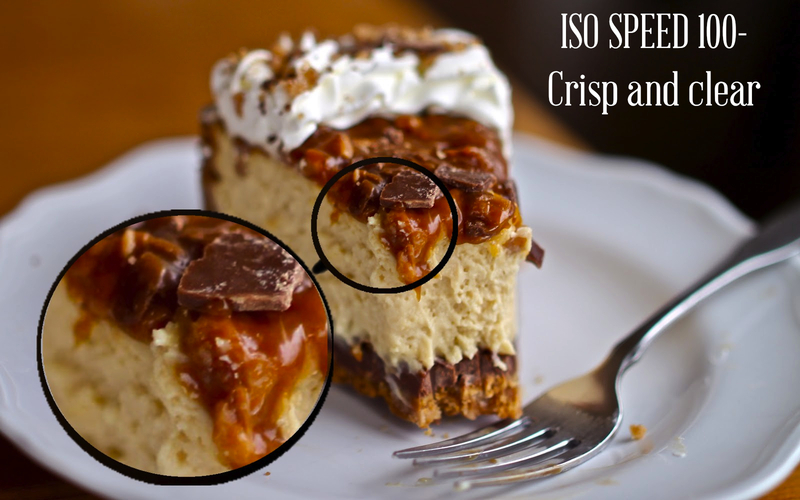 35mm is the perfect focal length on a cropped sensor for food photography and portrait photography. If you're interested in taking photos of birds or deer that will get scared away if you get too close (or if you are a spy or stalker and need to take pictures of people from far away without them noticing) you'll want a much longer focal length. Just make sure that you don't buy a DX lens if you have an FX camera. Taken with a 35mm lens from about 8 inches or so away. Some lenses don't even have auto-focus capabilities. 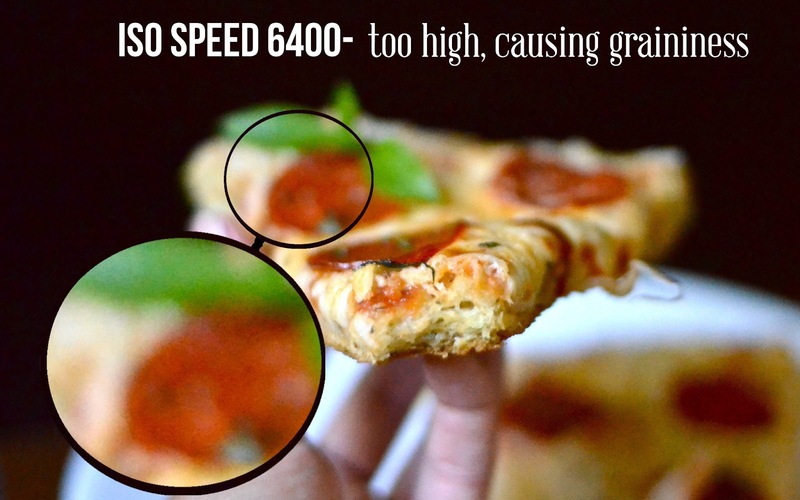 Some can only auto-focus with certain cameras. If you don't think you can handle manual focus alone, make sure you get a lens that has an auto-focus switch on the lens. Of course, my favorite lens (before it broke) was manual focus only and it worked great for me. Unlike the camera body, I feel that the brand of the lens you choose is very important. Samyang (also sold under the names Vivitar and Rokinon) is an excellent brand. I loved my old Vivitar 35mm f/1.4 Lens until I dropped and broke it (sob, sob, sniffle). The bokeh was incomparably smooth and beautiful and the photos were unbelievably crisp and clear. The cons to this lens: in was absolutely enormous and it only had manual focus (though that manual focus was incredibly smooth). It also had an aperture ring on the lens, instead of the aperture being controlled from the camera body, which wasn't necessarily a con. Sigma isn't worth your money (in my experience anyways). I bought a 35mm f/1.8 lens and the auto-focus it promised was slow and inaccurate, the bokeh was hideous, and the pictures were just overall fuzzy. Maybe it was just the lens, but I won't be buying Sigma again. Canon and Nikon lenses are great. As I've said, I currently have a Nikon 35mm f/1.8 lens . The quality is not quite as good as my old Vivitar (and the aperture doesn't open quite as wide), but it works well enough. Plus it has nice auto-focus, and is light and small so it fits in my case. This case is a dream come true, plenty of extra pockets and the camera fits in perfectly with the lens attached and is easy to access). Now that you have your camera and lens, you're ready to start taking pictures. It makes sense that the main thing to consider in photography is light, since that's really all a picture is. Captured light. There are four factors that contribute to how much light enters your lens. I've already explained aperture above in the lens section. The size of the aperture determines how dilated the "pupil" of the camera is. A wide aperture means more light and more bokeh. A small aperture means less light and less bokeh. Note the difference in depth of field at these two apertures. 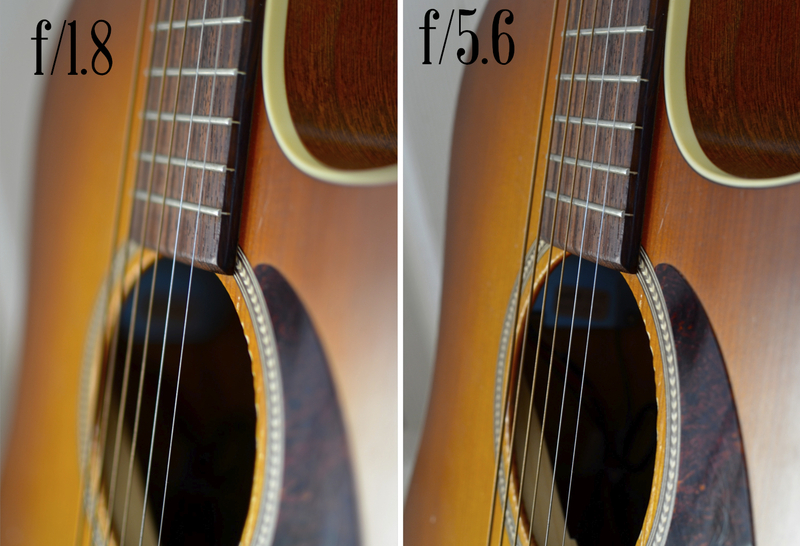 At f/1.8 only the first two strings of the guitar are in focus, while at f/5.6 all the strings are in the focusing area. 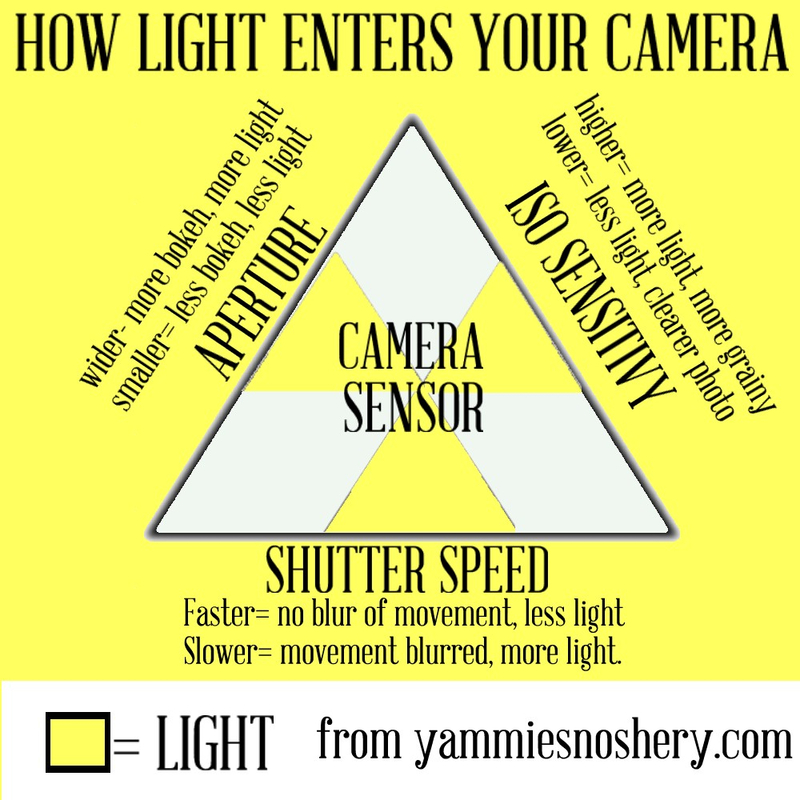 In other words, how long the sensor is exposed to light during the taking of your photo. 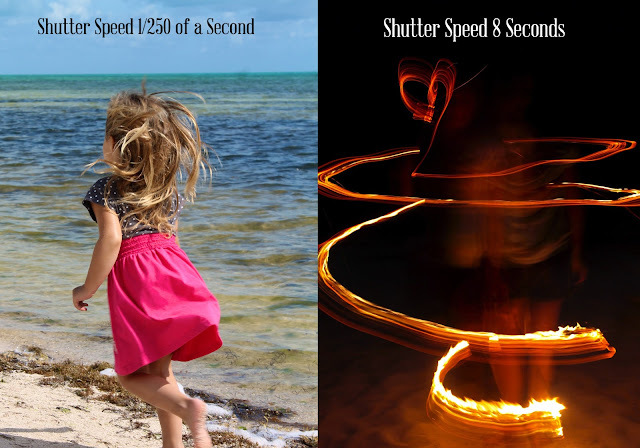 A slower shutter speed will show motion as a blur. A faster shutter speed will freeze the motion and catch the photo before the subject has a chance to move. If you want to have a slower shutter speed to capture movement (or because you need more light at a small aperture), you may want to use a tripod so that you don't catch your own movement in the photo. As you see here, a faster shutter speed can freeze the motion of your little sister's bouncing hair, while a slower shutter speed can catch the trail of light as your sister waves a flaming palm tree branch around her. This is how sensitive your camera sensor is to light. A lower level of ISO will be less sensitive to light and a higher level of ISO will be more sensitive to light. So you may think, "Well then. If I ever need some more light in my photo, I'll just increase the sensitivity and call it a day!" Sadly, it's not that simple. Though a higher ISO will give you more light, the increased sensitivity will cause graininess. So, lower ISO= less light, clearer photo; higher ISO= more light, grainier photo. I'm not talking about blurriness. Of course there's a lot of bokeh going on here so it's meant to be blurry. But the bokeh should be smooth, not grainy. This is the most important factor in composing a photo. There are many options for lighting; natural sunlight, moonlight, on-camera flash, off-camera flash, indoor lighting, birthday candles, sparklers, fireworks, etc. I use natural sunlight 95% of the time. I rarely use flash since I still only have the flash that came with my camera (which I'm not crazy about). As far as indoor lighting, tungsten and fluorescent are poor substitutes for natural sunlight (though sometimes I do use the fluorescent light above my stove for step-by-step photos when I must). When using natural light, try to avoid using direct sunlight. It will cause harsh shadows and highlights on your subject. I'm always going from window to window in the house trying to find decent lighting that's not too bright and not too dark for food photos. A thin film of clouds is a dream come true for outdoor portraiture. It's also fun to get creative with sunset or sunrise photos. 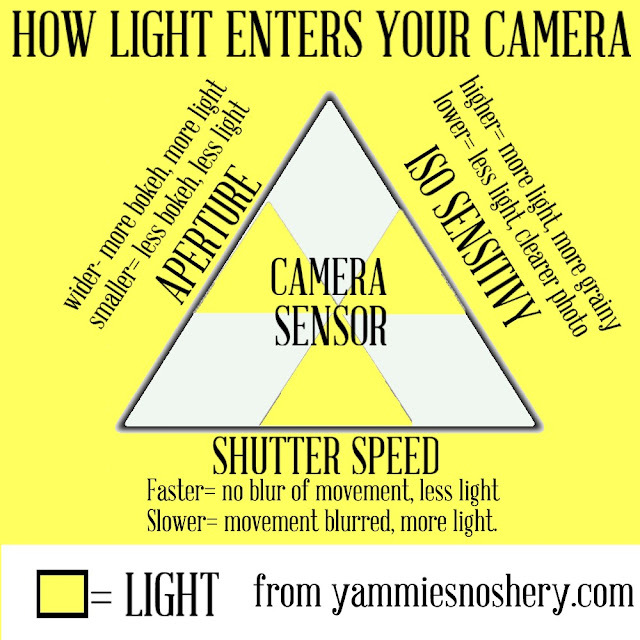 So basically you've got three ways that you can control the amount of light that enters your camera: aperture, shutter speed, and ISO sensitivity. The light travels through your aperture for a specified amount of time (controlled by shutter speed) and then hits your sensor which has a specified amount of sensitivity (ISO). High ISO is a last resort for adding more light since it adds graininess. I almost always shoot on Aperture Priority ("A" on your camera mode wheel) so that I can control the aperture and keep everything else on auto. That way I can choose how much bokeh I want and let the camera decide how much light it gets by changing the shutter speed and ISO itself. I also sometimes shoot with Shutter Priority ("S" on your camera wheel) if I want to shoot with a specific shutter speed. Ignore the fact that I misspelled "sensitivity". I'm too lazy to fix it. I usually keep my camera on auto white balance. Feel free to go into manual though and select "cloudy", "sunny", "tungsten", etc. or you can make your own custom white balance using these white balance cards . It's too much of a hassle for me though, considering the fact that I'm usually content with the auto white balance and if I'm not it's easily corrected in iPhoto or Photoshop (or whatever you use to edit your photos). Which brings me to the next topic. I enhance and edit 99% of my photos in iPhoto. Usually they need some cropping, straightening, and some basic enhancing. All it takes to enhance a photo is a little practice. You just have to keep playing around until you finally like how it looks. I can't tell you what I do with every photo because each one is unique, but I usually do have a somewhat of a process. Before anything I always crop and straighten it the way I want it. Then I typically do the "levels" first. Pulling the first tab to left will brighten up your highlights. Pulling that middle tab to the right will darken your midtones, and pulling it to the left will lighten them. Pulling the tab on the far right to the right will darken the shadows. Next, if the photo is still not exposed enough from playing around with the levels, I sometimes give it an extra brightness boost here with the "exposure". It the highlights become too bright you can always pull the "highlights" tab to the right, but not too much or they'll just look kind of grey. Then I give it a little more "contrast" and "definition" if it needs it (I don't usually do quite as much as I did here). Finally I go on to the color. It it looks dull I give it some saturation. Then I play around with the "temperature" and "tint" until it looks the color I remember being (this is how I correct any white balance issues). And that's all. Let me just start out by saying... ZOOM OUT (or if you have a prime lens... step back). Nothing says amateur like a picture that's so close up that you can't even tell what it is. Of course, those caramel toffee brownies were delicious, but the picture was horrid. Apart from the fact that you can't even tell what something is too close up, it tends to distort the image with a sort of fisheye effect. Remember... you can always crop, but you can never zoom back out. Also, try to get at more creative angles. I always do dozens of angles in each shoot and end up picking a few that I really liked. You're not going to get anywhere if you just stand beside your subject and point the camera from the most comfortable and predictable angle. Props are a great way to add interest to an otherwise boring photo. You can add all kinds of colors, textures, and feelings with props. I wish I used props more, but the truth is... I'm usually too lazy. Imagine how boring these seed cakes would have looked without a few props. No color, no excitement, no hint at their Lord of the Rings theme. 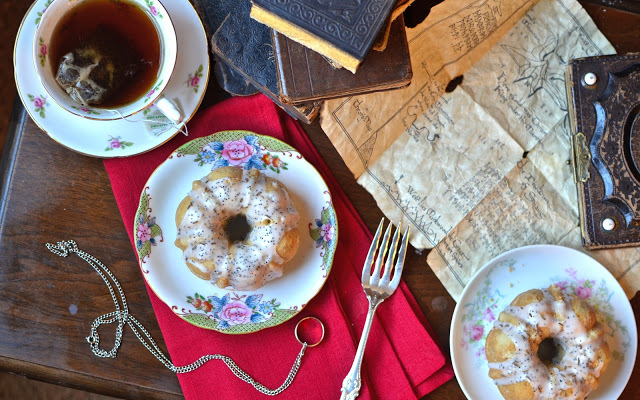 The red napkin and colorful plates give a splash of color, the old crinkly map gives some texture, and the tea and old books give it a vintage feel. Once again, a great way to add color. Adding a little green in the form of mint leaves, basil, or chives will instantly take your photo to the next level. Red peppers and tomatoes also make a photo pop. I've always hated when I look up a recipe and they've got beautiful photos, but they don't show you what the inside looks like! Does that cake have a fine crumb? Is that caramel thick and chewy or syrupy and gooey? Let that cheese ooze, let that caramel drip, and let's see the inside of that fat brownie! Make it look like it's ready to eat, like you can grab it right off the page. If you have any more questions, don't hesitate to ask in the comments! And don't forget to follow on Facebook, Twitter, and RSS!